Living in the wonderful state of California is a great privilege. While others are wrapping scarfs around their necks and preparing for a snowy and chilly winter we are experiencing 90 degree weather and driving down to the nearest beach…but don’t let this fool you! Winter is coming…even in California. So before we officially hit Winter…or it hits us, there are a couple things you can do to avoid costly home repairs later. We call it “Winterizing” your home. 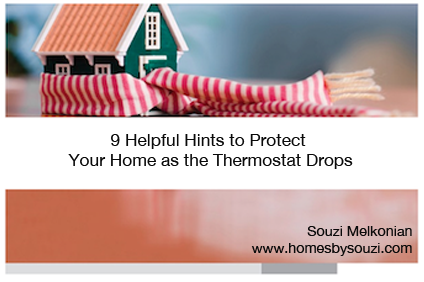 Below are 9 helpful hints to protect your home as the thermostat drops. 1. Inspect your roof and replace any damaged or missing roof shingles. 2. Make sure gutters and downspouts are free of leaves and debris. 3. Consider a fresh coat of paint or sealer on your deck. 4. On a windy day, close your windows and feel for air leaks. 5. Seal any leaks with rope caulk. 6. Install weather stripping on the sides or bottoms of any leaky doors. 9. If you haven’t had your fireplace chimney cleaned in a few year, hire a professional chimney sweep. If you need recommendations for local professionals who can perform these services around your home, please do not hesitate to reach out. I can help!